Carl W. Hofmann, 86, of Derry, died Monday, December 3, 2018 at his home. He was born January 22, 1932 in Derry, a son of the late Charles and Elsie Chamberlain Hofmann. Prior to his retirement in 1994 he had been employed by Latrobe Steel for over 33 years. He was a U.S. Navy veteran of the Korean War and had served in Pearl Harbor. Carl was a member of the Derry American Legion and VFW, Trinity Lutheran Church, the Derry Rod and Gun Club, the Derry Ukrainian Club, and B.P.O.E. in Latrobe. 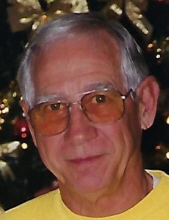 Carl was on several area golf and bowling leagues and was an avid gardener. In addition to his parents he was preceded in death by a sister, Louise Piper, a brother, Robert Hofmann, and an infant brother. Carl is survived by his loving wife of 36 years, Nancy J. Haney Hofmann, two daughters, Candee (Matthew Kent) Rhoades of McMurray and Christine (James) Vatter of Latrobe, three grandchildren, Emily Ann and Logan Rhoades and Kristopher Vatter, and a sister, Minnie Marie Penrose of Latrobe. Friends will be received Wednesday from 5-8:00PM at the J. Paul McCracken Funeral Chapel, Inc. 144 East Main Street, Ligonier, where Carl's life will be celebrated Thursday at 11:00AM with the Rev. Dr. J. Paul McCracken officiating. Interment will follow in the Menoher Memorial Park. To send flowers or a remembrance gift to the family of Carl W. Hofmann, please visit our Tribute Store. "Email Address" would like to share the life celebration of Carl W. Hofmann. Click on the "link" to go to share a favorite memory or leave a condolence message for the family.